As the CBI makes another attempt to undermine public sector pensions hot on the heels on the 3 Chancellors, will anyone benefit from all these proposed cuts? As the CBI makes another attempt to undermine public sector pensions hot on the heels of the statements of Alistair Darling, George Osborne and Vince Cable, the question being dodged is simple – will anyone benefit from all these proposed cuts? The Institute for Fiscal Studies published a report last week showing reforms to public sector pensions over the last few years will keep the main unfunded schemes for the NHS, teachers and Civil Service affordable over the medium term. 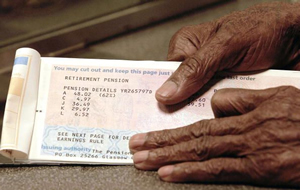 The largest scheme, the Local Government Pension Scheme, already incorporates many of the changes “experts” advocate: a retirement age of 65 for all existing and new entrants; graduated contributions that mean the higher paid pay more for their pensions than the lower paid; and a scheme agreed by members and employers for the future that has reduced the cost of all benefits built up since April 2008. Reforms rightly continue and a report published by the GMB earlier this year outlined a number of options available to ensure continued sustainability. The proposals many mainstream politicians put forward steer clear of this objective and instead focus on appeasing those who wish to reduce everyone’s pension to the lowest level possible. This short-termism is blinkered to the long-term pressure this puts on the taxpayer of the future. The majority in the public sector earn pensions of under £5,000 a year, dragging down the average occupational pension of the population as a whole. To fund this for the future, employees in the main schemes (covering the local government, health and education sectors) contribute on average 6.5% and their employers around 14% (again less than the comparable private sector figure). In local government this amounts to 5% of council tax while the local government scheme itself takes in £4-5bn a year more in contributions and investment returns than it pays out in pensioners’ benefits. This should be seen as a sustainable state of affairs in any sensible assessment. Political parties make much of their assurance that pensions that have been built up will be protected, a basic legal principle rather than an act of political generosity. The danger is that this merely signals excessively harsh cuts to future service as politicians try desperately to make impossible savings from the future to compensate for actual and perceived deficits from the past. In this rush to the bottom vital provisions could be cut with devastating long term consequences. Aside from setting fair and affordable member contribution rates, two benefits are key. The accrual rate, the rate at which pensions are built up, must stay at a level that makes a pension worth saving for. Once in payment, this pension must retain its value through proper indexation. Workers throughout the economy need these provisions and the country would be better served if pressure groups like the CBI worked on ways to raise the level of these benefits in the private sector. Asking low earners in the public sector to pay more for pensions that will not provide an adequate income in retirement will not solve the UK pension problem. Any appeasement of the right wing press these changes afford will be short lived as tales of increasing depravation among Britain’s pensioner population escalate. Reform of public sector pensions can be achieved but not if those who should know better continue to think arbitrary cuts to these workers’ pensions will make others better off. Aside from the recruitment and retention problems this will exacerbate in key parts of the public sector, reducing the pensions of low and median earners simply means higher taxes to fund greater demands on state benefits and public services. This debate is a serious one and needs to move beyond newspaper headlines into the realm of informed, honest debate. You may or may not have a point here, but your evidence looks selective and out of context which makes me suspicious. and is the size of the retired workforce the same as the currently employed ? Unlikely, and it would need to be to make this comparison valid. I know you’e only talking about local government but overall public sector employment in 1999 was 5.2m it’s now 6.1m. Those extra 0.9 are contributing but not withdrawing – yet! Is it the same in local government ? Also stating the excess of returns and contributions over benefits without saying the size of the fund is meaningless. It could be that excess of £5bn is a very low % of the fund size (you don’t say), in which case the fund won’t keep pace with inflation and you’re storing up deficits. > less than the comparable private sector figure). 2. local government are better at investing the contributions so they get better returns and don’t need to fund to the same level – anyone believe that ? 3. local government schemes are underfunded and the deficit will fall on future tax payers. The government SHOULD provide a decent pension to public sector employees. Can anyone deny that? George Osborne does not, just asks who will pay for it. If you read the IFS report you will find that it does NOT say that the reforms will make public sectors schemes “affordable” (whatever that means) and its so-called analysis deserves a D- because it assumes ALL private sector Defined benefit schemes are Final Salary schemes at the maximum level allowed by HMRC whereas they include a substantial number of Average Salary schemes and a fair number of Final Salary schemes at a lower level of accrual and some weird hybrids (I recently read one where pensionable salary was the lower of actual salary and the salary at date of change in the scheme rules uplifted by RPI, so promotions and pay rises ahead of inflation did not count but drops in real salary did) AND they treated the inflation-proofing in public sector and private-sector schemes as equivalent, which it is not due to 2.5% limit on the uplift for private sector schemes. A CPI target of 2% is roughly equivalent to an RPIX target of 3% so private sector pensions will decline by 0.5% pa – not a lot each year but cumulatively more than one-fifth between the start of my pension and the expected end of my wife’s widows pension. The IFS report that you quote shows (on its rosy-tinted view of private-sector pensions) that Public Sector Pensions are worth on average 25% of pay compared to 8% for Private Sector Pensions. Pay a decent wage and stop blackmailing people to work for low wages, by offering good or better pensions, if you cannot recruit it’s due to rubbish wages. This other Robert has a different point to make. One of the main drivers for companies to close down their defined benefits schemes was that the accounting rules changed to force companies to show the shortfalls in their pension schemes on their balance sheets. Quite a severe knock on from that on declared profits, share prices, dividends and so on. Something of a negative spiral. Not that I am saying that propping up the stock market on a bubble of pension schemes carrying actuarially calculated “off balance sheet” losses would have been morally acceptable – just what the effect is of being open, transparent and truthful. Really it was a precursor to the massive collapse of the US banking system in 2008 from the dishonest property bubble. The difference was that the first made us look properly at pension provision. The other wrecked the world economy. Your post is a diversion from the main subject which is public sector schemes but your post deserves some explanation. The problem was not the change in accounting policy – that merely shone the light on the existing situation – it was Brown’s change in taxation. HMRC has rules that say any pension scheme that is more than 10% “overfunded” loses its tax benefits. In the 1990s almost every scheme had more than two-thirds of its funds invested in equities despite taxation making equities more attractive than fixed-interest to tax-paying private investors because there were just not enough fixed-interest securities to match the assets of insurance companies and pension schemes. Brown’s tax raids reduced the value of equities to pension schemes by 20%. So pension schemes, in aggregate and in most individual cases, were instantaneously plunged into deficit. Please excuse me from commenting, apart from saying that I was arguing for more than 30 years that assets and liabilities should be valued using the same rate of interest, on SSAP24 as my views would breach the blog rules. I sympathise with you but the change to FRS17 did not make us look at Pension provision – that was a 1960s theme – it just forced a lot of people to acknowledge the damage that Brown had done. As you said the damage to one plc’s pension scheme reduces the value of its equity which reduces the value of other plcs’ pensions schemes etc which creates a downward spiral – a copy of the 1970s and the converse of the upward spiral in the 1990s bull market. However I assert that Brown’s single-handed evisceration of private sector pensions is not in itself a justification for similar treatment to public sector pensions.